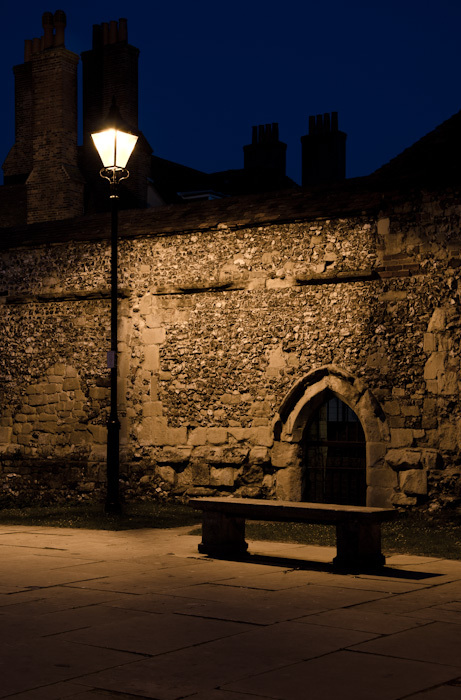 Using a tripod and long exposure, I was able to catch this shot in the grounds just in front of Winchester Cathedral. The zoom lens was at 40mm – more or less sight size. The aperture was set at f8, to get a decent depth of field. The ISO was fairly low at 200, in order to minimise ‘noise’. The compromise was in the speed: the exposure was 3 seconds, permitted by the use of a tripod. This allowed enough light in to make the shot, whilst not allowing the camera to automatically expose to the daylight levels it would seek. In editing, the intense yellow of the sodium streetlight has been reduced, to create a more natural representation of the colour of the stone. This latter is, of course, a dubious issue, since the natural colour of the stone in the dark is questionable, when colour is the reflection of light.